GUSTO POWER® is intended as a hub for the personal and professional development of Multi-Passionate Professionals™ — motivated, high-potential individuals with many talents and interests. 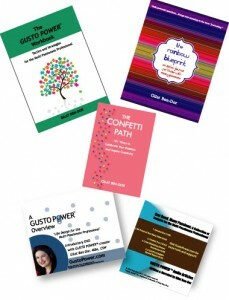 Our resources include individual and group coaching programs, as well as books, workbooks, journals, audio CDs, DVDs, articles , guides and reports written by GUSTO POWER® creator Gilat Ben-Dor. Visit the “SHOP” page on this website for more details, including the Limited Time TRIPLE POWER PACK LAUNCH SPECIAL. Please contact us to assist you or your team create maximum success as Multi-Passionate Professionals™!